Mauja was always our pyrfect angel of a puppy. She has a wonderful disposition and excelled through her obedience classes. She went everywhere with us and absolutely loved it. As she hit her adolescence, her enjoyment of new places slowly started to change. She began to exhibit anxiety in new situations, which led to poor manners. As with most adolescent dogs, her self-control started to become very poor. Her anxiety coupled with her lack of self control have been getting progressively worse. We are constantly working on self-control exercises in our house. From the moment a dog enters our house (even if they are only 8 weeks), they are taught to sit and stay when waiting for their food. We practice the “Nothing in Life is Free” philosophy in our house as well. Most people don’t know that giant breeds stay in their puppy to adolescence phase until they are at LEAST three years old. Many don’t fully mature until age 4 or 5. I’ve heard a lot of people say, “Oh yeah, my lab/pit/golden won’t mature until that age either”. These are very different concepts. A lab or other medium to large dog will most likely have excess energy until they are that age, but they are fully mature (mentally and physically) way before then. 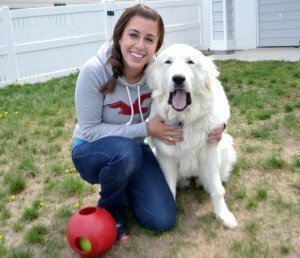 A 3 year old giant breed and a 1 year old medium breed are typically around the same mental mark. Having a 100 + pound puppy with minimal self-control and anxiety isn’t the easiest thing to deal with. 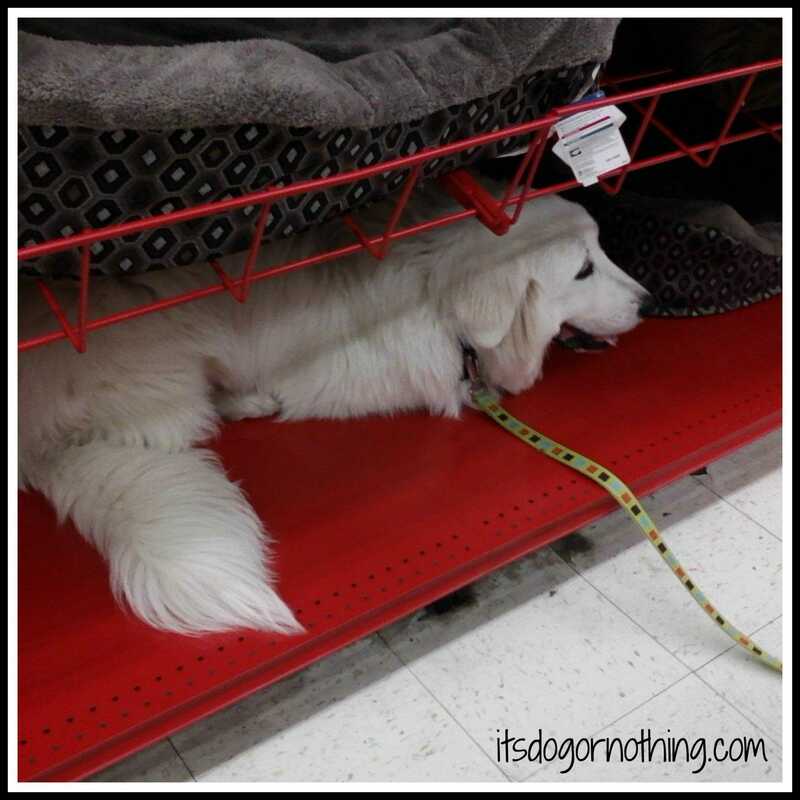 We try and continue to take Mauja to new places and use positive reinforcement to lessen her anxiety. Unfortunately, when Mauja gets worked up the tastiest treat in the world won’t get her attention. She goes into a panic mode. Mauja a few months ago at Petco. She was so anxious she crawled onto a shelf to hide. Since the systematic desensitization and positive reinforcement weren’t making a difference, I decided to try a new tactic. Off we went to get a Gentle Leader. Our first dog, Kaeto, was a leash reactive dog. We used a Gentle Leader on him to help keep control so I could have peace of mind in public places. He also loved squirrels and was surprisingly strong for a 50 pound dog. I remembered how effective the Gentle Leader was for him and decided it would be my new strategy for Mauja. After a few days of letting Mauja get used to the Gentle Leader, we decided to test it out. She was not a fan. She tried to rub her face against us, Atka, and the ground to get the Gentle Leader off. I wasn’t surprised. They take a long time to get used to. After we had walked around for a little, I decided to test some of her triggers. We walk past a lot of yards with dogs in them and Mauja always tries to drag us over to say hi. The Gentle Leader basically forces her to utilize her self-control. She would pull toward the dogs, feel the pressure from the leader, and then come back to a proper walking position. Gently adding tension was all she needed to understand to exercise her self-control. Doesn’t the blue look pyrfect on her? We are starting out very slowly and only working with triggers in situations where she is comfortable. Hopefully, in a few weeks we will be able to take her on an outing to Petco to see how she handles herself. So far, I’m very impressed with how the Gentle Leader is helping her control herself. It is going to be a great tool until we can achieve some calm and success with positive reinforcement. Have you tried a Gentle Leader? How did it work for you? If you would like to learn more about how to properly utilize the Gentle Leader for training, leave a comment below! I will happily do a video tutorial explaining the process. There’s still time to enter our giveaway! 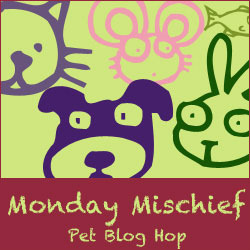 I am joining the Monday Mischief blog hop brought to you by Alfies Blog, Snoopys Dog Blog, My Brown Newfies. We went through a tutorial on them when we took Bailey to obedience training. We haven’t used one, but I can see why they’d be effective. They really are. 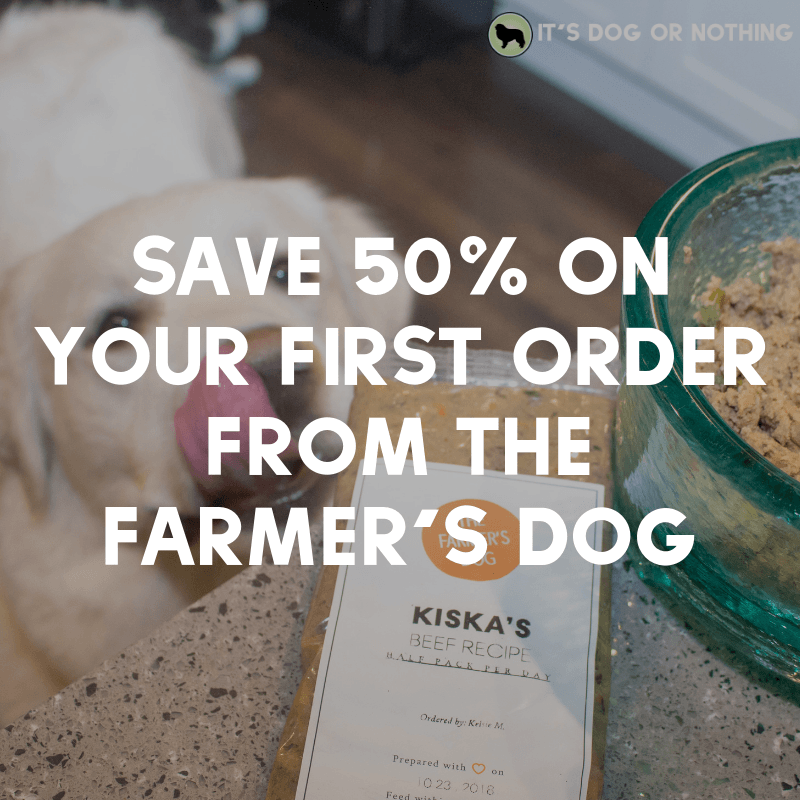 It’s amazing how it helps your dog utilize his/her self-control. We use a halti for my one husky Koda. Which is basically the same thing as the gentle lead except, judging from your photos, there is no part of the lead that goes up by the eyes. With the halti, it does, and Koda hated that! Otherwise though, it stops his pulling 100%. I’m grateful small dogs mature fast! I don’t get quite the science behind why small dogs mature faster and giant dogs mature slower. I have no idea either! It’s definitely something more people should be aware of before getting a giant breed. Aw, that shelf picture in PetCo makes me feel so sad for her 🙁 Poor thing. I really hope the gentle leader helps! When I worked at an animal shelter, the gentle leaders always worked wonders on the more anxious dogs that tended to pull on a leash. There are quite a few dogs that were crazy reactive and jumped up all the time that turned into PERFECT walkers when we used the gentle leader. Hope it works for Mauja! I wish we could utilize the leaders at the shelter where I volunteer. So many dogs could benefit from using one. So far, it is basically forcing Mauja to utilize her self-control. I’m hopeful that we’ll continue making progress! Ah, I have a red Gentle Leader and it didn’t take me long to figure out how to take my Human on a merry run. I just stiffen my neck and head and plow on ahead!!! or toward a dog I want to meet!!! I weigh 100 lbs so if I decide to do something my Human is at my mercy! BOL!!! My Human had what she thought was a great idea…she didn’t like the training collar and the horses wear halters and even big stallions are fairly easy to control with a halter. Thus I ended up with the Gentle Leader. I didn’t mind it, especially once I figured out I could control her better with the new head halter. At the vets office I took the vet tech on a wild stumbling race around the back! BOL! I am usually obedient, well behaved and don’t pull no matter what collar I’m wearing…but sometimes!!! Haha that’s so funny! I hope Mauja doesn’t learn that trick. So far, if she feels even the slightest pressure she slows down. I don’t need her dragging me down the street! 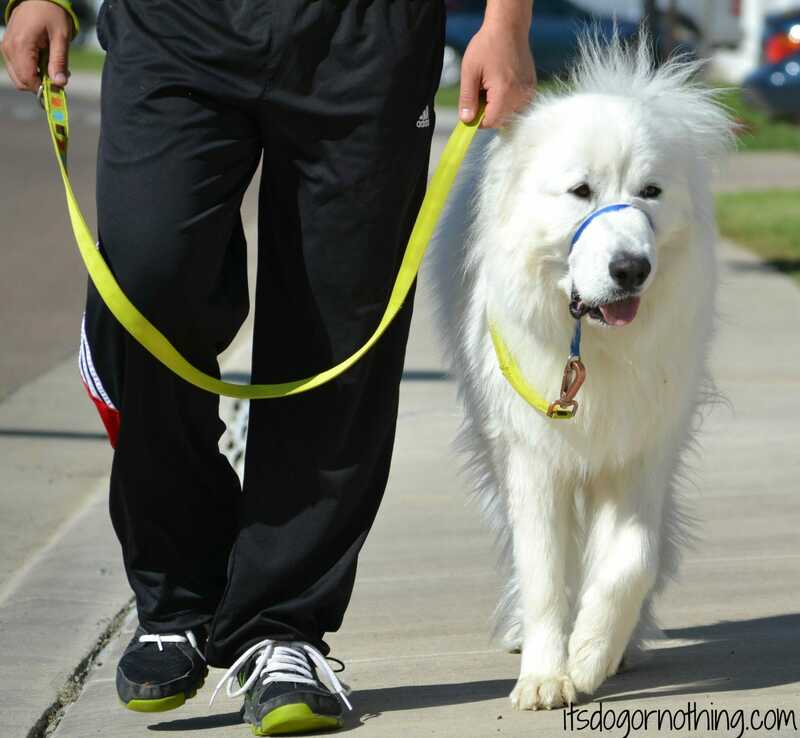 I’ve heard lots of great things about gentle leader before but have never used one. I don’t know what Shiner would think of it! I’ve never tried one – I’m fortunate that Jack is a perfect walker – loves just walking by my side…lucked out on that. I do love the blue color against her white fur though. 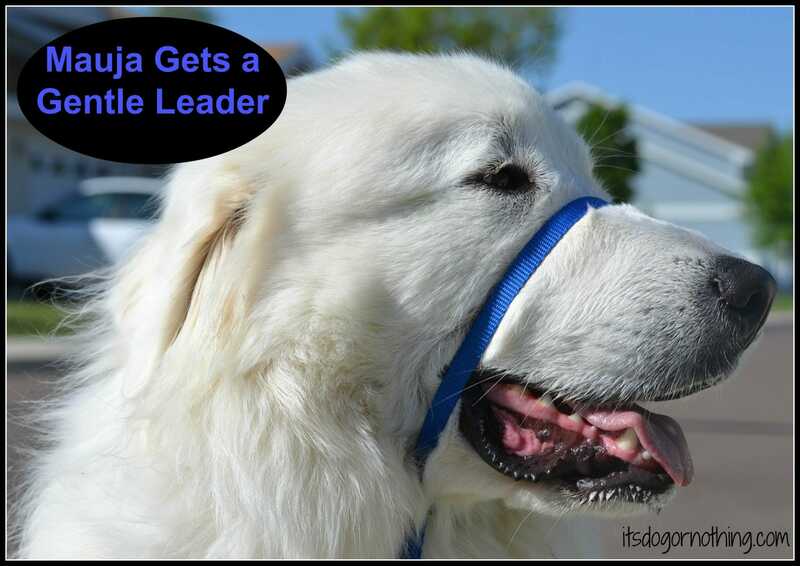 We’ve never used a gentle leader but it looks like you are having success with it! That’s great! Definitely! Let’s just hope it keeps working so I can help her through her anxiety.